What do you know of Raag Mala? The composition of Raag Mala found in a handwritten Saroop of Sri Guru Granth Sahib Ji. The literal meaning of the word Raag Mala (ਰਾਗ ਮਾਲਾ) is: a chain/necklace (Mala) of Raags (musical measures) i.e., a list of Raags. This list differs according to the author and the music school it is based upon. Thus there exists a number of such lists in the music text books. Raag Mala is also the title of a composition of twelve verses, running into sixty lines, appended to most copies of Sri Guru Granth Sahib Ji as a list of Raags that appears after Mundaavani (ਮੁੰਦਾਵਣੀ), i.e. the epilogue or “closing seal”. In many of the older copies of Sri Guru Granth Sahib Ji, Raag Mala appears at the end, after other compositions which were added by various scribes but later discredited and deemed unauthorised by the Sikh Panth (nation). This Raag Mala must not be read as an index of raags of Sri Guru Granth Sahib Ji, for it is only a list of popular Raags sung at the time period of Sikh Gurus. Moreover there are Raags mentioned in the Raag Mala which are not included in Sri Guru Granth Sahib Ji, and there are raags used in Sri Guru Granth Sahib Ji which are not mentioned in the Raag Mala. In fact the Raag Mala included in Sri Guru Granth Sahib Ji is no way related to the Raags used by the Sikh Gurus to compose their revealed hymns. It is just an independent list of Raags based on Hanuman Mat School of music. It is also important to note that unlike various Schools of Music and the Raag Mala, there is no mention of Raagnis (consort of Raags) or their sons in Sri Guru Granth Sahib Ji. Different teachers of Indian classical music have divided and arranged Raags to make their own style of Indian classical music, in which particular Raags are given importance, and coupled with other Raags to make new Raags. These are called Raag Malas. The analogy is given of a family of Raags where Raags are paired with Raagnis (female musical melodies) to give birth children of new Raags. None of these are like for like. Each way goes by a different name of school of thought. There are more schools of Indian classic music, like Somnath Mat (ਸੋਮਨਾਥ ਮੱਤ), Matang Mat (ਮਤੰਗ ਮੱਤ), Paastik Mat (ਪਾਸਟਿਕ ਮੱਤ), Saarang Mat (ਸਾਰੰਗ ਮੱਤ), Kashiap Mat (ਕਸ਼ਿਅਪ ਮੱਤ), Bhaav Bhatt Mat (ਭਾਵ ਭੱਟ ਮੱਤ), Sangeet Ratnaakar Mat (ਸੰਗੀਤ ਰਤਨਾਕਰ ਮੱਤ) etc. But these Raags are not divided or categorised using the analogy of males, wives, sons, daughters and daughter-in-laws. From the above it is clear that in accordance to Indian classical music, each Raag Mala is different. In one Raag Mala a Raag’s wife, is in another Raag Mala’s a Raag’s son; in the third Raag Mala, it is another Raag’s daughter; and in the fourth Raag Mala it is another Raag’s daughter-in-law. So this is for the benefit of Indian classical musicians from which they are informed how by changing musical tunes more and more Raags can be formed and when how Raags with matching musical tunes are understood to be a family. Raags are not people or living beings that they have husbands, wives, sons, daughters, and daughter-in-laws. The identity of Raags is the mind’s imagination created by Indian classical musicians. Raags are not limited to 84 Raags, 132 Raags, or 180 Raags. They have continually increase and will continue to do so. There is no limit to the families of Raags and Raagnis, and there is no end of those who use Raag to sing Vahiguru’s Praises. The Raag Mala that appears in copies of Sri Guru Granth Sahib Ji is also part of a Hindi love poem called ‘Maadhav Nal Kaam Kundla’ (ਮਾਧਵ ਨਲ ਕਾਮ ਕੰਦਲਾ) written by a Sufi-Muslim Kavi (poet) Alam. The story has two main characters. One is Maadhav Nal, the court Pandit (priest) as well competent top class expert in classical Indian Raags. The other is Kaam Kundla, a court dancer and concubine. Both the characters were of matchless excellence. Kaam Kundla was a Muslim woman from Kashmir. According to the story, Kaam Kundla sang 84 Raags (as listed in Raag Mala that appears appended to copies of Sri Guru Granth Sahib Ji). Kavi Alam wrote this story based on available old literature in 1583. This is not fictional, but a historical story from the ninth century in a place called Bilhari (ਬਿਲਹਾਰੀ) the kingdom of Raja Gobind Rai (Chand). According to Archaeological Survey of India, Report No. 9 (page 37), it is written that Madhva Nal made a palace for his lover Kaam Kundla, where ruins still exist. At the end of this report a picture of a temple of Kaam Kundla is given (see, Table No. 7). Copies of this poem are in Punjabi University (Punjabi Language Department), Patialia, Punjab University Library Lahore, Sri Guru Ram Das Library and Sikh Reference Library, Amritsar. There are two renowned poets of the name Alam. The first poet Alam is the author of ‘Maadhav Nal Kaam Kundla’, a contemporary of the Mughal king Akbar, and wasn’t familiar with Sanskrit. The second poet Alam was a Hindu Brahmin convert to Islam, a contemporary of the Mughal king Bahadar Shah and Sri Guru Gobind Singh Ji, and was familiar with Sanskrit. Raag Mala is a part of poet Alam’s poetic text which appears from the 34th stanza to the 38th stanza. The total poem consists of 179 stanzas. This poetic text which contacts Raag Mala was compiled in 1583 during the reign of Akbar, 21 years before the compilation of Sri Guru Granth Sahib Ji by Guru Arjan Dev Ji in 1604. The Raag Mala appended to copies of Sri Guru Granth Sahib Ji and the Raag Mala of Alam in ‘Maadhav Nal Kaam Kundla’ are word for word the same, with a few words slightly changed in the process of scribing it from Hindi to Gurmukhi script. For example, in place of ਅਸਲੇਖੀ (As-lekhi), is written ਆਸਾਲੋਭੀ (Asa-lobhi); and in place of ਚੰਦ੍ਰਬਿੰਬ (Chandra-bimb), is ਚੰਦ੍ਰਗ੍ਰਸਨ (Chandra-grasan). RAAG MALA – STOLEN FROM GURBANI OR ADDED TO GURBANI? FACT: Raag Mala is found in Poet Alam’s poem Maadhav Nal Kaam Kundla published in 1583, 21 years before the compilation of Sri Guru Granth Sahib Ji. According to renowned early 20th century research scholar of S.G.P.C, Shamsher Singh Ashok, who supported the view that Raag Mala was not included by the Sikh Gurus, states in research paper that it was most likely scribed in the blank pages that followed the ending of a handwritten copy of Sri Guru Granth Sahib Ji by simple-minded Sikh who had an interest in Indian systems of music, and who had little paper available and wanted to memorise different Raags out of personal interest. The practice of scribing composition outside of Gurbani, for example the description of the method of preparing the ink and paper, spiritual devotion techniques etc, in the blank pages at the end of old handwritten Sri Guru Granth Sahib Ji became a common practice. The consequence of this was that these compositions by mistake gained the status as the Word of God. Copies of Sri Guru Granth Sahib Ji that never had Raag Mala in them, had Raag Mala scribed within them. Sikhs did not pay attention to stopping anyone making this mistake because at the time the Khalsa was fighting battles for the survival of the community, the Panth was engaged in other matters, and due to an increase of blind-faith no one dared to contemplate on the matter. On the other hand, according to Bhai Vir Singh, who was supported the view that Raag Mala had being included by the Sikh Gurus, argued that the poet Alam had stolen and plagiarised Gurbani in his love poem ‘Maadhav Nal Kaam Kundla’. However, Bhai Vir Singh does not explain in his writings that if this was the case why the Sikhs of the time did not challenge poet Alam for plagiarising Gurbani, why the Guru Arjan Dev Ji made no objection and stand like he had made against Bhai Banno adding his compositions to the end of Sri Guru Granth Sahib Ji, or why there is no mention of this particular plagiarism in ancient Sikh texts in favour for Raag Mala being Gurbani. The Raag Mala controversy goes back two centuries ago. The first Sikh scholar who publicly challenged that Raag Mala is not Gurbani, but the composition of the poet Alam, was the great poet and historian, Bhai Santokh Singh (1783–1843), the author of Gur Prataap Suraj Granth. Bhai Santokh Singh, also known as Maha Kavi Santokh Singh, was the student of Giani Sant Singh (1768 – 1832), a renowned man of letters and custodian of Sri Darbar Sahib, Amritsar. The modern day Damdami Taksaal lays claim that Giani Sant Singh is in the lineage of Jathedaars or leaders of Damdami Taksaal that is claimed to have been lead by Guru Gobind Singh Ji and then Baba Deep Singh Ji. According the book Damdami Takssal De Mahapurkh published by Damdami Taksaal (Jatha Bhindran), Giani Sant Singh Ji is the sixth Jathedaar of Damdami Taksaal, which asserts that it has an unbroken lineage of spiritual wisdom and knowledge. Bhai Santokh Singh’s Gur Prataap Suraj Granth portrays in comprehensive detail the lives of the Ten Gurus and the career of Banda Singh Bahadur. Besides being an historical narrative of great significance, it is an outstanding creation in the style epic, and is the most voluminous of all poetic compositions in Hindi/Punjabi literature. Its language is Braj Bhaasha which was the literary Hindi of that time though its script is Gurmukhi. Notwithstanding certain drawbacks which scholars with training in modern historiography may point out, it remains the most valuable source book on Sikh history of the period of the Gurus and, indeed, on the very roots of the entire Sikh tradition. For the massive flow of its poetry, the vast range of its figures and images and for the abundance of detail, Sri Gur Pratap Suraj Granth, Suraj Prakash in shorter, popular form, is worthy to rank with the classics in this genre. The phrase and imagery in both the parts of the book generally require expert explanation. This has been provided, painstakingly and exhaustively, by Bhai Vir Singh in a 14-volume annotated edition brought out in 1927-35. Bhai Vir Singh has also added notes where necessary. In most Sampardaic Deras, included Damdami Taksaal, which teach how to do Katha and train Kathavachiks, Suraj Prakash is one of the key texts they would use. It is usual for gianis (learned scholars), in particular those of the Damdami Taksaal and Sampardaic tradition, to hold serial discourses on the text of Suraj Prakaash in gurdwaras, normally in the afternoons or evenings. Then when the Lahore and Amritsar Singh Sabha Movement came in force to propagate the Sikh religion, then Sikh scholars such as Giani Sardool Singh, Dr. Charan Singh, Bhai Kahn Singh Nabha and others made special efforts to raise the issue that Raag Mala is not Gurbani. On 17th November, 1899, Bhai Vir Singh brought out the first issue of the weekly Khalsa Samachar, which besides Panthic news, contained valuable information about the tenets of the Sikh faith, elucidation of Gurbani, and imparting teaching of the faith in a big way. In the Khalsa Samachar, Bhai Vir Singh wrote against Raag Mala and his companions stopped reading it. However, after having a falling out with Babu Teja Singh, Bhai Vir Singh changed his stance and became a proponent for Raag Mala and opposed Babu Teja Singh. In defending Raag Mala, Bhai Vir Singh wrote that poet of the name Jodh wrote the love-poem ‘Maadhav Nal Kaam Kundla’ in which the author copied Raag Mala from Sri Guru Granth Sahib Ji into their poem. In 1900, at the time of the founding of the Chief Khalsa Diwan, Sri Guru Granth Sahib Ji was printed without containing Raag Mala. One such Bir is reported to be present now at Gujarwal in Ludhiana District. Again another printing of Sri Guru Granth Sahib Ji took place in 1915 without Raag Mala in Gurmat Press at Amritsar – one of which is also present in Singh Sabha Gurdwara at Gujarwal. At that time the two main Sikh organizations, Tat Khalsa and Chief Khalsa Diwan, propagated zealously against reading Raag Mala. In 1918, the issue of Raag Mala reached its peak. To descedit Raag Mala Giani Sher Singh published Ragmala Darpan and Mastar Mota Singh published material. Similarly, in favour of Raag Mala, Bhai Sahib Singh Dhamdhaam wrote Raagmala Prabodh and Maan Singh B.A., a solicitor from Ambala, published a tract under the name of Sach Da Prakaash. The two publications mentioned that were in favour of Raag Mala have no mention of poet Jodh. Bhai Sahib Singh Dhamdhaan wrote (p. 24) that the poet Alam copied Raag Mala from Sri Guru Granth Sahib Ji, and that his book (Maadhav Nal Kaam Kundla) cannot be traced to find out information of how it was compiled (p. 18). IS RAAG MALA WRITTEN IN THE KARTARPUR BEERH? Those who in favour of Raag Mala being the work of the Guru, would argue that it appears in the Kartarpur Beerh which was scribed by Bhai Gurdas Ji and dictated by Guru Arjan Dev Ji. It also appears in many other handwritten saroops of Sri Guru Granth Sahib Ji. For them this is proof that it is Gurbani and should not be doubted. The other viewpoint, opposing Raag Mala as the work of the Guru, argue that the copy of Sri Guru Granth Sahib Ji that is known as the Kartar Beerh is not proof that Raag Mala is Gurbani. According to Jodh Singh – Kartarpuri Bir De Darshan, pp. 121-122 – the last pages of the Kartarpur Beerh do not suggest, either because of the presence of blank spaces, or scoring out, or obliteration hortal, or otherwise, that there was or could have been the least intention to write Raag Mala in Sri Guru Granth Sahib Ji. The Mundaavani is on ang (page) 973/1. Angs 973/2 and 974/1 are blank, and on ang 974/2 is Raag Mala. As such, there could never have been the possibility, nor could it ever have been contemplated that these three writings requiring a space of over four pages could have been accommodated on the two blank angs 973/2 and 974/1. Bhai Kahn Singh Nabha also states that Mundaavani is on ang 973 of the Kartarpur Beerh and that ang 974 is blank but later scholars state that there is Raag Mala on Ang 974. This means that the Beerh that is propagated as Aad Beerh at Kartarpur is not the Beerh that Nabha jee saw but either a different Beerh or the altered Beerh from the original. On page 973 of the Kartarpur Beerh is written Mundaavani but the second half of page 973 is blank. From this is clear that the original Pothi is a total of 974 pages and nothing beyond. Raag Mala appears after. DOES RAAG MALA APPEAR IN SAROOPS SCRIBED BY BABA DEEP SINGH HELD AT THE FOUR TAKHTS? After careful study, Bhai Joginder Singh Talwara and Giani Joginder Singh Vedanti, a former student of Damdami Taksaal and former Akal Takht Jathedaar, could not find any such saroop that they felt was authentic to be scribed by Shaheed Baba Deep Singh Ji since none matched the other. No academic scholar has ever said there existed any such beerh which they have been able to find. If someone can show these beerhs or give some concrete information about them, it would be helpful to the whole Panth. Some groups and individuals within the Panth have made public claims that certain saroops are handwritten by Shaheed Baba Deep Singh Ji or have the stamp and signature of Sri Guru Gobind Singh Ji in order to assert their claim that Raag Mala is Gurbani and included by Sri Guru Granth Sahib Ji by Sri Guru Gobind Singh Ji. The normal public, who has little knowledge of scriptures, are lured to believe such claims, which usually have either financial motives or an agenda. A recent saroop falsely claimed to be written by Baba Deep Singh by Sikh Channel. In the same TV coverage an expert said it was 250 years old. The owners of the saroop refused a team of experts from Sri Harmandir Sahib to examine the saroop, yet they appealed on TV for the Sikh community to give them donations for the renovation of the historic saroop. Firstly, the word ‘puraatan’ means ‘old.’ A fifty years old written or printed copy of Sri Guru Granth Sahib Ji could be classified ‘puraatan’. Similarly, a 100 years old copy of Sri Guru Granth Sahib Ji would be called the same. Therefore, to state a saroop is puraatan does not mean much when researching the saroop. Saroops written in the period of Guru Arjan Dev Ji to Guru Gobind Singh Ji are saroops that can be identified as ‘Guru-Kaal’, the period of the Guru. Then are saroops written post Guru Gobind Singh Ji period, followed saroops written in the Misls period in the mid to late 18th century. The majority of old saroops were written during the Sikh Raj and commissioned by Maharaja Ranjit Singh. The saroops from this particular period are decorated with gold and include paintings and illustrations. To validate the authenticity of any saroop you would have to carbon date the paper first, and then the ink. However, nowadays, without any carbon dating some mischievous individuals make claims of puraatan saroops in order to justify that Raag Mala is Gurbani. The recently discovered Anandpuri Beerh of Sri Guru Granth Sahib Ji has had its ink and paper carbon dated to the period of Sri Guru Gobind Singh Ji. Not only this, it includes the stamp and signature of Sri Guru Gobind Singh Ji, and researchers have matched the ink and handwriting of the beerh to the Zafarnamah. This particular beerh was discovered some years ago, does not contain Raag Mala. There are 8 raags that are utilised in Sri Guru Granth Sahib Ji that have not been mentioned in the Raag Mala. These are: Bihagara, Wadahans, Manjh, Jaitsri, Ramkali, Tukhari, Prabhati and Jaijawanti. Mali-Gaura is not included in Raag Mala but Gaura is. In Sri Guru Granth Sahib Ji no distinction has been made between raags and raagnis and all the measures employed have been given the status of raags, each one of them recognized in its own right and not as “wife” or “son” to another raag. In practice over a long stretch of time, Gurmat Sangeet, i.e. Sikh music, has evolved its own style and conventions which make it a system distinct from other Indian systems. The Raagmala appended to Sri Guru Granth Sahib Ji is not much different from the others, and, by itself, does not set up a new system. This Raagmala is nearest to the Hanuman Mat, but the arrangement of raags in Sri Guru Granth Sahib Ji is nearer to the Saiv Mala and the Kalinath Mat which give primacy to Siree Raag. The only system wherein occur all the raags and sub-raags employed in Sri Guru Granth Sahib Ji is Bharat Mat. The Raagmala has given Bhairav the first position in the ‘mala’ (ਪ੍ਰਥਮ ਰਾਗ ਭੈਰਉ ਵੈ ਕਰਹੀ ||), but in the Raag system of Sri Guru Granth Sahib Ji Bhairav has been relegated to 24th position. According to Sri Guru Granth Sahib Ji, Siree Raag has the first position and is called the supreme Raag (ਰਾਗਾ ਵਿਚਿ ਸ੍ਰੀਰਾਗੁ ਹੈ ਜੇ ਸਚਿ ਧਰੇ ਪਿਆਰੁ || – ang 83), which is backed up by Bhai Gurdas Ji (ਰਾਗਨ ਮੈ ਸਿਰੀਰਾਗੁ ਪਾਰਸ ਪਖਾਨ ਹੈ || – Vaar 42: Pauri 376). This has made most of the scholars doubt its relevance to the Raag system of Sri Guru Granth Sahib. Either Raagmala is the truth and Bhairav is the first position Raag and supreme, which implies Sri Guru Granth Sahib Ji is false in saying Siree Raag is supreme and has first position. Or Raagmala is false and Sri Guru Granth Sahib Ji is true in saying that Siree Raag is supreme and in first position. In the fifth line of Raagmala the word Pun (ਪੁਨਿ = ਫਿਰ; ਸੰਸਕ੍ਰਿਤ ਪੁਨਹ ਦਾ ਰੂਪ) has been used. This is a derivation of Sanskrit word Punah. On the other hand, in Sri Guru Granth Sahib wherever the derivation of Sankrit word Punah has been used it occurs in its prevalent Punjabi version, i.e., as Phun (ਫੁਨਿ). Nowhere it has been written as Pun (ਪੁਨਿ). Prof. Sahib Singh thinks it to be a strange occurrence of this word in Raagmala since no Guru ever used this word in Gurbani to mean what is conveyed in Raagmala. Unlike Gurbani in Sri Guru Granth Sahib there is no Mehla in the title of Raagmala. According to style of Sri Guru Granth Sahib Ji after any Raag there is an indication of authorship by Mehla, e.g. Mehla 4 etc. The whole of Sri Guru Granth Sahib Ji is unambiguous in this respect. There is no shalok in Sri Guru Granth Sahib Ji where Sikhs have to guess about its author. If we closely study Shabad, Ashtpadia, Chhand in Sri Guru Granth Sahib we find that there is a unique system if serialisation of stanzas with numbers. When a band or couplet ends, it is given a number to indicate its position in the hymn, and that it can now stand alone, and is complete in its meaning. The fifth Guru evolved a hierarchical system of numbering where the total number of couplets and Shabads are explicitly mentioned as totals and grand totals that run concurrently. This nesting is so distinctive that it does not allow anyone to add or delete a couplet without disturbing the numbering system. This is a fool proof method for the protection of originality of Gurbani. Now compare it with the unorganized system of numbering in Raagmala. See the style of describing Bhairav Rag in 8 lines of a Chaupai. There is || ੧ || after eight lines of Chaupai. But note that in the last two lines all the 8 sons of Bhairav Rag could not be included. Lalit and Bilawal are in the next couplet (Dohra), and there is also || ੧ || at the end of this Dohra. This type of inadequacy in indicating a complete family of a Raag is also seen for other Raags. Apparently the system of Raagmala has no similarity with that followed by the Great Guru. In Ragamala ||੧|| is used all through and at the end it occurs twice ||੧|| ||੧||. Clearly, the style does not follow that used in Sri Guru Granth Sahib. See the following couplet where the last line of Band (couplet) describes that from the next Band will start Deepak Raag. This way the couplet does not stand alone as is the system followed in Sri Guru Granth Sahib. Guru Arjan Dev ji evolved a unique system of grammer for Gurbani. This system is also followed by Bhai Gurdas in his poetry of Vaars. It is surprising to read ਰਾਗ ਏਕ ਸੰਗਿ ਪੰਚ ਬਰੰਗਨ ||; there is no Aunkar (ੁ ) below ਰਾਗ ਏਕ to indicate plurality or singularity of ਰਾਗ and ਏਕ. However, both words here indicate singularity that any one Raag has five wives and eight sons. Similar examples of use of Muktaa and Sihaari in Raagmala that do not follow the grammar of Gurbani exist. If Raagmala is Gurbani then Guru Arjan Dev Ji and Bhai Gurdas Ji changed the style of Gurbani used in Sri Guru Granth Sahib Ji for a different style in Raagmala or Raagmala is not written by Guru Arjan Dev ji or Bhai Gurdas ji. There being no indication to this effect in the caption, the authorship of Raagmala has been the subject of controversy; more so the point whether it should form part of the recitation of Gurbani in its entirety (i.e. being included in Sehaj Paath or Akhand Paath bhog/completion). According to The Encyclopaedia of Sikhism, “The composition is not integral to the theme of Sri Guru Granth Sahib Ji, and it has little musicological, instructional or spiritual significance.” Yet it is entered in the original volume of the Aad Granth Sahib Ji prepared by Guru Arjan Dev Ji and preserved to this day in descendant family at Kartarpur. Saroop dating between 1839 and 1843 from the National Museum, New Delhi. The above picture shows Raagmala in a Saroop which is a profusely decorated copy of the Damdami Beerh – lavishly illuminated in Kashmiri style. The saroop was commissioned by Sodhi Bhan Singh of Haranpur (district Jhelum) between 1839 and 1843, it was produced by Kashmiri artist Miha Singh and the scribe Misar Prakas. Bhan Singh was a Sodhi decendent of Prithi Chand (boycotted as ‘Minas’) some have argued the production of this beerh was an attempt to show the real or imagined postion of Bhan Singh – he is shown at the centre of many illustrations, in one he is worshipping Mahakaal and in another performing a ‘Havan’ . “Oankaar” on first page of Saroop. The Sodhis regained some standing and prestige during the time of Maharaja Ranjit Singh – it is thought this beerh was intended to be presented to Ranjit Singh – the beerh is of a very large format – intended to be on ‘display’. The beerh also has a number of very interesting elements – Indic deities such as the incarnations of Vishnu are shown in ‘dvadashakamalas’ – twelve petalled lotuses, perhaps the most striking element is the ‘Onkaars’ that head the ‘raag’ sections and the ‘tatkaraa’ – they are composite illustrations showing Devi, Brahma, Vishnu and Lakhsmi – sometimes the ‘Oankaars’ are flanked by Ganesh and Hanuman. The ‘Formless’ made from Indic deities. The puraatan (old) saroops that did or do include Raagmala (like Bhai Banno Beerh) also included other compositions after Mundaavni (but before Raagmala), such as: (i) Jit Dar Lakh Mohammada, (ii) Siahi Di Bhidhi, (iii) Ratanmala, (iv) Hakeekatrah mukam, (v) Praan Sangli, (vi) Rab Mukam Ki Sabk, (vii) Baye Atisb (16 saloks) etc. All seven of these compositions that existed after Mundaavni (but before Raagmala) were all unanimously discredited by the Panth and it was acknowledged that mischievous individuals had over time included these compositions at the end of Sri Guru Granth Sahib Ji but had no standing against Gurbani. Although Giani Dit Singh produced research and photographs of Saroops of Sri Guru Granth Sahib Ji that end with Mundaavani and the Salok in his book entintled “Mundaavani”, some scholars strongly claim that pro-Raag Mala supporters mischievously unnecessarily cremated volumes of Saroops that didn’t contain Raag Mala and other disputed compositions. The index page of an ancient Saroop of Sri Guru Granth Sahib Ji which states Mundaavuni is the closing Bani. An ancient Saroop of Sri Guru Granth Sahib which shows in it’s index that the closing is Mundaavuni. The following ang (page) states that the Saroop has been copied from the Aad Beerh (original Volume) of Sri Guru Granth Sahib by Guru Arjan Dev Ji from Kartarpur. A Saroop scribed in Kartarpur in 1742 CE which ends with Mundaavuni & Salok. Patna Sahib Beerh (Volume) ends with Mundaavuni – the calligraphy is exceptional – the picture shows a note by the scribe saying the beerh has been copied and checked against the Aad Granth birh scribed by Bhai Gurdas ji. A Saroop of Sri Guru Granth Sahib Ji discovered in Manger (ਮੰਗੇਰ) in Bihar that dates to 1732 and ends with Mundaavani. A Saroop of Sri Guru Granth Sahib Ji that ends with Mundaavanee. A Saroop of Sri Guru Granth Sahib Ji discovered in Manger (ਮੰਗੇਰ) in Bihar that dates to 1732 and ends with Mundaavani. It has the Nishaan of the Ninth Guru. A puratan saroop from Takht Sri Damdama Sahib that ends with Mundaavani. According to Dr. S. S. Kapoor, the Sikh scholars differ in their opinion about its inclusion in Sri Guru Granth Sahib Ji. The traditional school thinks it to be a part of Sri Granth Sahib Ji and asserts that it is an index of the raags used in Sri Granth Sahib Ji. This argument can be challenged on the grounds that a number of raags mentioned Raag Mala are not in Sri Granth Sahib Ji and a number of raags used in Sri Granth Sahib Ji are not in the Raag Mala. Another argument of the traditional schools that it is a part of the original copy and is written in the same ink and with the same pen as was used for the other parts of Sri Guru Granth Sahib Ji. This plea also does not carry any weight as in those days all the scribes used almost the same ink and the same type of pen. As the writing of the Gurmukhi characters was also the same so it becomes rather difficult to identify the handwriting. It is said by the modern scholars that it was Bhai Banno who might have been instrumental in its inclusion (along with other compositions that are considered ‘kachi bani’) in the Granth as he had the possession of the original copy of the Granth when he took it to Lahore for binding. Scholars and Saints for Raagmala: Bhai Sahib Vir Singh; Dr. Jodh Singh; Akali Kaur Singh; Giani Baba Gurbachan Singh (Jatha Bhindran), and Sant Samaaj (“Society of Saints” that was set up in the early 20th century). 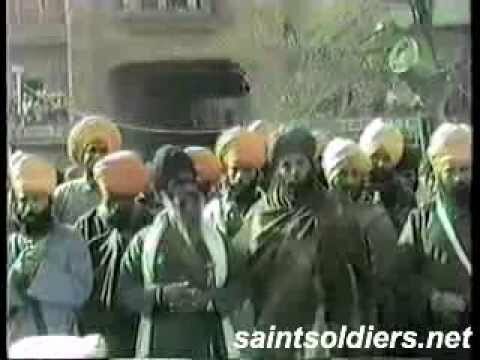 Scholars and Saints against Raagmala: Famous Sikh historian Giani Gian Singh, Â Giani Ditt Singh, Prof. Gurmukh Singh (founders of Singh Sabha Movement); Pandit Tara Singh Nirotam; ; Sant Arjun Singh Vaid; Sadhu Gobind Singh Nirmala; Prof. Hazara Singh; Bhai Sahib Bhai Kahan Singh Nabha, the author of Mahan Kosh; Master Mota Singh; Master Mehtab Singh; Master Tara Singh; Gyani Sher Singh; Giani Nahar Singh; Principal Dharmanant Singh; Giani Bishan Singh Teeka-kar; Sant Baba Teja Singh Mastuana Wale; Principal Ganga Singh; Dr. Ganda Singh; Prof. Sahib Singh; S. Shamsher Singh Ashok Research Scholar of S.G.P.C. ; Bhai Randhir Singh, research scholar; Pandit Kartar Singh Daakhaa; Principal Bawa Harkishan Singh; Principal Narinjan Singh; Prof. Gurbachan Singh Talib; Principal Gurmukhnihal Singh; Shaheed Bhai Fauja Singh; Shaheed Bhai Sukhdev Singh Babbar; Shaheed Bhai Anokh Singh Babbar etc. Bhai Sahib Bhai Vir Singh: In his early life, Bhai Sahib Vir Singh, a Sikh scholar, did not consider Raag Mala as been authored by any of the Sikh Gurus and therefore it shouldn’t be included in Sri Guru Granth Sahib Ji. However, he later came to the opinion that the Raag Mala contained in Sri Guru Granth Sahib Ji is Gurbani. He has been quoted as stating Guru Arjan Dev Ji was the author and another occasion Bhai Gurdas Ji was the author. But his opinion near the end of his lfie was that Raag Mala was prepared by Guru Nanak Dev Ji and it contains a list of popular raags of that period of time. Giani Baba Gurbachan Singh (Jatha Bhindran): According to Giani Baba Gurbachan Singh, Guru Arjan Dev Ji was getting Mundaavani scribed down and completing the Sri Aad Granth, and at the moment the raags (musical measures) come to meet Guru Ji in the form of Naarad Muni (a sage). Guru Ji witnessed the terrible state of the raags in the form of Naarad Muni and asked what had happened. Naarad Muni replied (i.e. the raags, musical notes): “Someone sings us at night (i.e. brothels), normal people sing us, everyone seems to use us and ignorant people have lost our value. We are being dishonoured.” Bhai Gurdaas had the scribe in his hand. One by one all the raags came to the Sanctuary of Guru Arjan Dev asking to be saved. Guru Ji told Bhai Gurdaas, “These raags have come here for Protection, the “Bhog” (completion) is just about to come. Add the raags into the end of the Granth so that they are saved.” Bhai Gurdas accepted the Hukam. As each raag (musical measure) prostrated in front of the Guru, the raags were scribed down and that’s how the composition of “Raag-Mala” came to be scribed. “Raagmala being the heading does not indicate which of our Great Gurus wrote Raagmala and since there is no mention whatsoever of the word ‘Nanak’ in the writing it is comprehensible that our Great Gurus had no hand in writing Raagmala.”RESPONSE: Raagmala has something in common with Japji Sahib. Both do not indicate which of our Gurus wrote them. ‘Nanak’ doesn’t appear in 7 paurees (verses) of Japji Sahib. [Note : However the word ‘Nanak’ appears 39 times in Japji Sahib though. Also there is no dispute in the whole Panth that Guru Nanak Dev Ji revealed Japji Sahib. However those who argue for Raagmala cannot even reach a consensus on who is the author Raagmala – Guru Nanak Dev Ji, Guru Arjan Dev Ji or Bhai Gurdaas Ji?]. “The order in which various raags are mentioned in Raagmala do not correspond to the order in which the same raag appears in Sri Guru Granth Sahib Ji. The first raag, which is also considered supreme, in Sri Guru Granth Sahib Ji and Bhai Gurdaas Ji’s Bani is ‘Sri Rag’, while in Raagmala it is ‘Bhairo.”RESPONSE: The order of raags that appear in Raagmala are irrelevant to the writing of it as it is not an index of the raags in Sri Guru Granth Sahib Ji. Ragmala and Gurbani in general have deeper mystical meanings if we don’t understand or can’t comprehend these deeper hidden jewels that does not mean we should simply disregard it as we don’t understand. “The following raags which are contained in Sri Guru Granth Sahib Ji do not emerge in Raagmala i.e. raags Maajh, Bihaagra Jaitsri, Ramkali, Mali Gaura, Tukhari, Prabhati, and Jaijavanti. Therefore the assertion that Raagmala is a mala (rosary) of the raags in Sri Guru Granth Sahib Ji is not true.”RESPONSE: Nobody argued that Raagmala is a mere rosary of the raags in Sri Guru Granth Sahib Ji. Guru Ji decided what raags to include in Raagmala. In Gurbani the word raag also means prem (love) so Raagmala is also a rosary of love it is not merely a rosary of raags based on deeper mystical meanings. “In Raagmala the counting system of phrases is totally different to the system used in Sri Guru Granth Sahib Ji i.e. in Raagmala ||1|| or No. 1 appears after each phrase and the end of Raagmala. In Sri Guru Granth Sahib Ji the totalling system is 1,2,3,4,5,6 etc and this can be clearly seen in the first hymn in Sri Guru Granth Sahib Ji i.e. in Jap Ji Sahib the first pauree (stanza) has 1 and the last has 38.”RESPONSE: This statement is incorrect as Jap Ji Sahib actually has two ‘1’s at the start and a ‘1’ at the end after the Salok. The 1,2,3,4,5,6 etc numbering system is present in Sri Guru Granth Sahib Ji but is not consistent throughout. Just as in Jap Ji Sahib there are other verses of Gurbani that have the No. 1 after paurees that follow each other – do we then also discount these as Gurbani as they are not adhering to this stringent numerical system. “The word ‘Mundavani’ means ‘the seal of closure’ and therefore anything after Salok Mahalla 5 really cannot be accepted as Gurbani. Since Raagmala is after Salok Mahalla 5 it cannot be sanctioned as part of Gurbani.”RESPONSE: If Mudavani is the seal of closure then technically we cannot accept Salok Mahalla 5 as this is a separate Shabad which comes after Mudhavani Mahalla 5. In fact the word Mudavani is present on two other occasions in Sri Guru Granth Sahib Ji on Ang 645 within the same Shabad in Vaar of Sorat(h). So if we follow this line of argument anything after this Shabad is not Gurbani – how ludicrous is that! The meaning of Mudavani is not ‘seal of closure’ but on the contrary it means ‘riddle’ – a riddle that Guru Ji is stating in this Shabad. Guru Ji states in Mundavani that: “Upon this Plate, three things have been placed: Truth, Contentment and Contemplation. The Amrit Naam, the Name of our Lord and Master, has been placed upon it as well; it is the Support of all. One who eats it and enjoys it shall be saved. This thing can never be forsaken; keep this always and forever in your mind. The dark world-ocean is crossed over, by grasping the Feet of the Lord; O Nanak, it is all the extension of God. ||1||”. The riddle is understanding the true meaning of these lines which is that in the platter of Sri Guru Granth Sahib Ji the Amrit Naam of Shabad has been placed by contemplating and studying this Shabad one attains truth and contentment. [Note : Firstly, Salok Mahalla 5 is connected to Mundavani and therefore not separate. Secondly, the word ‘Mudaavanee’ (ਮੁਦਾਵਣੀ) which is without tippee sound ( ੰ ) that makes a ‘un’ sound, means ‘riddle’. This word is used in the Shabad of the Third Guru on ang 645. However, ਮੁੰਦਾਵਣੀ, spelt with the tippee sound ( ੰ ) included means ‘closing seal’ or ‘sealed stamp’. According to the Mahaan Kosh (Sikh Encyclopaedia) written by Bhai Kahn Singh Nabha, the main meaning of Mundavani means ‘Seal of closure,’ however it can also mean ‘Riddle’ or ‘Hidden’. In closing Sri Guru Granth Sahib Ji, it would make sense that you would ‘seal’ it. As a consequence of this Guru Teg Bahadar Ji’s Bani was added before Mundavani. If didn’t mean “seal of closure” it would have been added after. RESPONSE: In 1945 the SGPC set up a sub-committee to investigate whether Raagmala is included in the original Kartpuri Beerh of Sri Guru Granth Sahib Ji that was compiled by Sri Guru Arjan Dev Ji. The following is from their: “We can most definitely say that nobody other than Bhai Gurdas Jee who was the scribe included Raagmala in Sri Guru Granth Sahib Ji. Raagmala is an ang of Sri Guru Granth Sahib.” They also stated that they the ink paper and handwriting of Raagmala was consistent with the rest of the saroop. When this first saroop of Sri Guru Granth Sahib Ji was compiled many had made supplications to Sri Guru Arjan Dev Ji to include their writings but Guru Ji rejected many only those who had merged with God could utter Gurbani as it is the word of God Himself. The final Saroop of Sri Guru Granth Sahib Ji as we know it today was compiled by Sri Guru Gobind Singh Ji and Baba Deep Singh Ji compiled 4 other Saroops of this final version and they were sent to all Five Takhats. All these Saroops have Raagmala in them again it is written in the same handwriting ink and upon the same paper. The above mentioned works are not present in any of these Saroops and they unanimously accepted not as the writings of the Guru and only few Saroops have these works in them. [Note : The problem with the entire Raagmala debate is that we in general don’t do the research or study ourselves. We rely on what others tell us and become emotional about the issue. Please read the findings of Bhai Kahn Singh Nabha shown in this article. The SGPC sub-comittee did not conclude that Raagmala is written by the Sikh Gurus and if that was the case the Sikh Rehat Maryada would have been changed to state that everyone should read Raagmala and there would be no issue left. Bhai Kahn Singh Nabha writes that that when the Sikh Gurus would write Hukamnamas (edicts) to the Sangats (congregations) they would safeguard these letters from adulteration by writing in words how many lines they have written after their signature. Similarly, this practice was followed up to the time of the Ninth Guru that every copy of Sri Guru Granth Sahib Ji had its page numbers written down at the end of the contents. Following this rule, the Kartarpur Bir has the following written at the end of the contents: “ਸੰਨ ੧੬੬੧ ਮਿਤੀ ਭਾਡੋ ਵਦੀ ੧ ਪੋਥੀ ਲਿਕ ਪਹੁੰਚੇ || ਸਾਰੇ ਪਤ੍ਰੇ ਗੁਰੂ ਬਾਬੇ ਜੀ ਦੇ ੯੭੪ ||” (Translation: “Year 1661, date Bhadon Vadi 1, the Pothi has been written and arrived. All of the pages of Guru Baba Ji is 974”). On page 973 of the Kartarpur Bir is written Mundavni but the second half of page 973 is blank. From this is clear that the original Pothi ia a total of 974 pages and nothing beyond. Raagmala appears after. Then we come to the issue of Bhai Mani Singh saroops and saroops by Baba Deep Singh. After study, Bhai Joginder Singh Talwara could not find any such saroop that he felt was authentic since none matched any other. No academic scholar has ever said there existed any such Beerh which they have been able to find. If someone can show me these Beerhs or give some concrete information about them, it would be helpful to the whole Panth. “Raagmala which comes after Mudavni in the printed versions of Sri Guru Granth Sahib Ji was not written by Sri Guru Arjan Dev Ji. It is part of a book called Mudhavnal Kamkandla written by poet Alam in 1640 Bikramee (1583 AD) 21 years before Sri Guru Granth Sahib Ji was compiled by Sri Guru Arjan Dev Ji.”RESPONSE: It was a poet named Jodh who wrote Madhvanal Kamkandla in 1583 AD – Raagmala or anything even resembling it is not present in the original version of this book. The poet Alam lived from 1655 to 1717 AD and after listening to or reading Raagmala he wrote a book called Madhvanal Sangeet that was mostly copied work from other poets including Jodh. There is also a poem in this compilation which doubters of Raagmala believe is Raagmala but it is actually very different to Raagmala. In the past century people have mistakenly linked the work of these poets’ as one and the same because Alam plagerised much of his work from Jodh and they try to prove that Raagmala is not Gurbani with this mistaken line of argument. Historically there are 11 different versions of Raagmala they all differ from the original which is in Sri Guru Granth Sahib Ji different writers over time have gained inspiration from Raagmala in Sri Guru Granth Sahib Ji and then gone on to write their own versions of Raagmala. In Sri Guru Granth Sahib Ji there are 2 different versions of Barah Maha one in Raag Maaj and the other in Raag Tukaree. There are also many versions of Barah Maha written by various authors should we then argue that these two Barah Maha’s are not Gurbani? S. Shamsher Singh Ashok Research Scholar of S.G.P.C. RESPONSE: It would be very easy to make a list of Gursikhs who were held in high regard that believed Raagmala is Gurbani as well. Similar to the above list it would include great scholars freedom fighters spiritualists and selfless servants of the Khalsa Panth. The other point to note is that Sikhs throughout the world read Raagmala and it only a minority who question or doubt it’s authenticity there are only a few Gurdwaras throughout the world where Raagmala is not recited and it is recited at Sri Harimander Sahib (Golden Temple). [Note : In regards to Sri Harmander Sahib, it should be noted that Raagmala was never recited at Sri Akal Takht Sahib, by even during the times Baba Jarnail Singh Bhindranwale were staying there. In 1986 when Jasbir Singh Rode became Jathedaar and changed this and forced the reading of Raagmala. There is a specific protocol or Maryada for changing the running at Akal Takht; the Jathedar cannot do as he pleases. The vast majority of Sikhs do not even know of Raagmala, let alone the controversy behind its authenticity. If Raagmala is printed in all modern saroops of Sri Guru Granth Sahib Ji then it is natural that someone who does not know of the controversy of Raagmala (which is the majority) would read it. Furthermore, pro-Raagmala preachers in modern times have made provocative attacks in the Sangat against those who don’t read Raagmala and scare-mongered people into reading it with baseless stories. Just because the majority read it is not a sound argument that it’s Gurbani. The majority of Gurdwaras in the world have non-Amritdharis and Patits (apostates) who make and serve Langar and even Degh – is this okay because the majority practice it? The majority of those that claim to be Sikhs cut their hair and indulge in alcohol and meat – is this argument for its acceptance? No would be the answer and these people would need educating. Jathedar Bhai Mohan Singh Nagoke summoned a joint meeting of the saints and scholars in 1945 at Sri Akaal Takhat Sahib with the sole objective of resolving the issue once and for all. Jathedar Nagoke himself performed the initial ardaas (prayer) and affirmed that if it is proved after mutual discussion and debate that Raag Mala is not Gurbani, it would never be read at Sri Akaal Takhat Sahib. The pro-Raag Mala group could not give clear cut proof to establish that Raag Mala is Gurbani. They walked out in disgust. Thereupon Jathedar Nagoke declared that in the interest of maintaining Panthic unity the reading of Raag Mala was to be optional. Those who want it read after Mundaavani may, but after this decree from Takhat Sahib nobody should raise the issue for or against it. He also declared that henceforth it would not be recited at the Sri Akaal Takhat Sahib. After a few days, Master Tara Singh, who was President of Shiromani Akali Dal, sent a special emissary, Giani Lal Singh of Sikh Missionary College Amritsar (ex-chairman Punjab Public Service Commission Patiala) to Giani Baba Gurbachan Singh (Jatha Bhindran) to ascertain as to whether he would be abiding by the decree of Sri Akaal Takhat Sahib. Giani Lal Singh returned after a weeks stay at Bhinder Kalan, with a written message that Jatha Bhindran bows before the decree of Sri Akaal Takhat Sahib. The veracity of the said message can be gauged from the fact that as long as Giani Baba Gurbachan Singh lived the issue was never raked up by him. In the meantime Shiromani Gurdwara Parbandhak Committee (SGPC) included the contents of the decree in the Sikh code of conduct (Sikh Rehat Maryada). This was universally acclaimed by all. Since the Sikh nation as a whole accepted that Raag Mala was not written by Guru Arjan Dev ji, bhog ceremonies were performed after Mundaavani Mahalla 5 and Salok Mahalla 5. Many historical Sikh Gurdwaras such as Nankana Sahib, Khadur Sahib, Taran Tarn Sahib adopted this practice. However, some Sikh saints and groups have been raking the issue of Raagmala in modern times again and again for their selfish motives. Since 1936 Raag Mala has not been read in the concluding of scriptural reading of Sri Guru Granth Sahib Ji. Since 1936 Raag Mala has not been read in the concluding of scriptural reading of Sri Guru Granth Sahib Ji. From July 1983 till his martyrdom in June 1984, Sant Jarnail Singh resided in the Sri Harmandir Sahib complex. Despite being strongly in favour of Raag Mala being the Guru’s work, in line with the tradition of his predecessors of the seminary he led, he not once made an attempt to alter the Maryada of Sri Akaal Takht Sahib or force them to read Raag Mala. On the contrary, when his nephew, Swaran Singh Rhode, forced the reading of Raag Mala at Sri Akaal Takht Sahib, he slapped and scolded him for changing the Maryada of Sri Akaal Takht Sahib. In the April 1986 Sarbat Khalsa, Raag Mala was not, despite the completion of the reading of Sri Guru Granth Sahib Ji was done by the students of Damdami Taksaal (Jatha Bhindran). This was in respect of the Maryada of Sri Akaal Takht Sahib as was shown by Shaheed Sant Jarnail Singh Bhindranwale. However, in March 1988 Bhai Jasbir Singh ‘Rodhe’, nephew of Sant Jarnail Singh Bhindranwale), became the then Jathedar of Sri Akal Takhat, and replaced the Panth approved Maryada with the Maryada of Damdami Taksaal. This was an unprecedented move that even Sant Jarnail Singh Ji did not impose or implement during his stay at Sri Harmandir Sahib up until his martyrdom. According to P.P.S. Gill, “Genesis and Shape of ‘Rehat Maryada’ debate” published in The Tribune (13 August, 1993), on March 30, 1988, Bhai Jasbir Singh Rhode issued a directive at Anandpur Sahib to start the reading of Raag Mala at Sri Akal Takhat. Although the SGPC resisted the move initially, it tactically kept silent and postponed to implement its own decision (Resolution No. 11, passed on 11 June 1988) of reverting to the earlier Maryada in the wake of militancy in the Punjab. But when the political situation changed, the SGPC executive took the decision in a meeting at Gurdwara Sangh Dhesian (in Jalandhar district), in May 1993 to revert to the Maryada prevalent before March 30, 1988, at Harimandir Sahib and Sri Akal Takhat Sahib. The issue of Raag Mala cannot be solved or imposed by one individual or group – it has to be unanimous decision of the collective Khalsa Panth. In following the Panthic stance on Raag Mala, love and unity can be maintained between different schools of thought and individuals, which is demonstrated in the love shared between saints such as Baba Gurbachan Singh Ji Bhindranwale and Bhai Sahib Bhai Randheer Singh Ji, Baba Kartar Singh Ji Bhindranwale and Bhai Sahib Jeevan Singh Ji, or Shaheed Baba Jarnail Singh Ji BhindranWale and Shaheed Bhai Fauja Singh Ji. 2. Shamsher Singh Ashok. Ragala Nirnai. Amritsar, n.d.
6. Madan Singh. 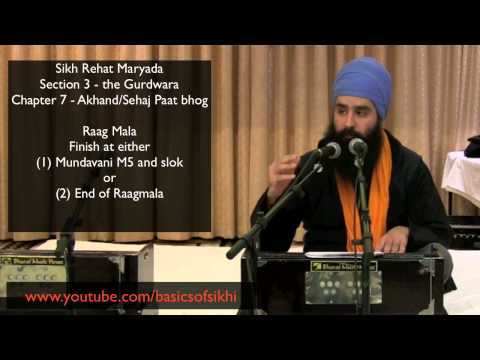 Raag Maala – A Re-appraisal in the Context of Sri Guru Granth Sahib Ji. Amritsar, 2003. 7. Taran Singh. Ragmala. The Encyclopaedia of Sikhism, Vol. III. Ed. Harbans Singh. Punjabi University, Patiala, 1997. P 426. « What Teeka (commentary) of Sri Guru Granth Sahib Ji do you recommend? Very well researched and balanced article! God is one. He is realized by guru’s grace. The first major tune is Raag Bhairao (Devotee’s tune). It sings the praise of God in a group of five including other sub tunes. Your praises are sung in melodious tunes. These are the five tunes of major tune Bhairao. All five sing Your praises joyfully in godly tunes. Tunes Lalat and Bilaaval – each have their own melody. also sing Your praises in the group of five tunes! Gondakaree and Dev Gandhaaree sing Your praises in loud voice. Maaroo raag is the devotional tune of Maiwar sung emotionally in the group. Then comes Hindol (joy); all sing Your praises in the group of five. with the best attire including saffron on forehead. here also Your praises are sung in the group of five tunes. sandalwood on the forehead and wearing the sacred thread. praises in tune basant with musical instruments. God pervades in every one. Todee raag is sung with lot of zest in the group of five tunes. all are the children of the same flower The God. All join and sing Siree Raag (tune to honor God) that also is sung in the group of five. Bairaaree is the tune of Karnaatka. The Aasaavaree is sung in a simple tune. Deep tune Raag Saarag is sung in deep devotion and raag Gond is serious. Also sung in the group of five tunes! The tunes Sorath, Gond, and Malaar are part of Mayagh raag. Everywhere the devotees and the prophets sing Your praises. Those are the names of the sons of God the Maygh Raag. totaling thirty in Your admiration. One more added later.